Update 2/18/19: Welcome to KetoCook! I have been developing ketogenic recipes since 2010 for my daughter who successfully manages Dravet’s Syndrome (epilepsy) with the ketogenic diet. You will find most of the recipes on this site make 1 serving. This is because her version of the ketogenic diet is so strict, nutritional requirements are met to the gram using a software program called the KetoDietCalculator. Please feel free to multiply the recipe quantities to make larger servings. I am also in the process of adding standard measurements to many of the recipes, but this takes time! You can find many more recent keto recipes I have developed at the Charlie Foundation. It has been one of the biggest honors of my life to work with Jim Abrahams and continue the mission of the Charlie Foundation by developing and photographing recipes, writing eBooks and managing their social media outlets. I also consult with Cambrooke Therapeutics on their KetoVie Cafe line of prepared ketogenic foods available by mail. I hope you find this site useful on your keto journey! I have been making these for MONTHS, trying to perfect them. I just could not get past the grittiness of almond flour in pancakes! I’m convinced, the only way around this is to buy blanched almonds (ones with no brown skin) and grind them into butter. NOT almond flour, it has to be butter. Almond butter from a jar does not taste as mild as the blanched almonds. So make a large batch of blanched almond (butter) and keep it in the fridge. I also really love the combination of lemon juice, almond extract and Walden Farms Blueberry Syrup. Let me know what you think! Melt the butter in a small microwave safe bowl. Add the egg, lemon juice and extract to the melted butter and stir to combine. Next, add the balanced almonds that have been ground into a smooth butter, baking powder, baking soda and stir until everything is evenly distributed. Lightly oil on a non stick flat griddle. The heat should be medium high. Pour the batter in to small 3-inch pancakes. Cook until you see bubbles forming on the tops and the edges look dry. Flip to cook the other side. If your pancake batter keeps spreading on the griddle and the edges are paper-thin, the heat is too low and they will never be fluffy! 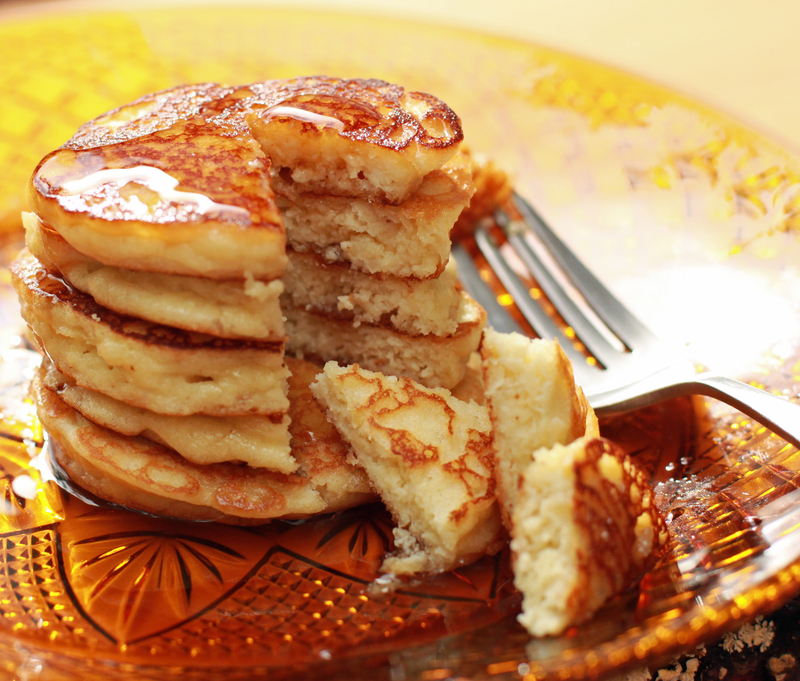 The batter should “round” and puff up around the edges almost immediately when you pour the batter onto the griddle. If you like this recipe, you’ll love my Cauliflower & Cheddar Hash Browns! I’ll be speaking about “fostering independence for children on ketogenic therapies” at the GLUT 1 Conference in Washington DC. In June, I’m at KetoCon in Austin, TX. Visit me at the Charlie Foundation booth. You can find more of my keto recipes at the Charlie Foundation. These turned out really tasty. I always buy unsalted butter, and even with the baking soda I felt the need to add a little salt to the batter for next time. I would say maybe an 1/8 teaspoon. Overall these cooked up very well and tasted delicious. Thank you! This recipe is amazing. I’m very picky about mock versions. usually they just disappoint and i avoid them. Makes me long for the real thing. This is the real deal. awesome substitution. great job. Hi Dawn, I’m confused about the almonds. The ingredients say to use almond powder but the directions reference almond butter.Should I ground up whole almonds into a butter or use almond flour? I’m guessing flour from the title of the recipe! thanks! I specified almond flour for the calculation because almond flour is just blanched almonds ground into flour. They will have the same nutritional content. You can use almond flour if you want, they will not have as fine of a texture. The confusion stems from this, and I myself would like some clairifcation even still. There is a big difference between almond butter, and almond meal (and even almond flour if you really want to get technical). So is it a situation where you want us to use almond butter, or do you want us to use ground “almonds, butter, etc” ? These look amazing, and I cannot wait to make them. Sorry for the delay in replying! I updated the instructions a little… In the first paragraph, I stated to buy blanched almonds and grind them into a smooth butter using a food processor. I mentioned the “almond flour” because if you are following the medical version of the keto diet you will need to know what to choose in the ketocalc to calculate the meal for the correct ratio and calories. I am not referring to “almond butter” as they type you buy pre-made in the jar (although you could try using it anyway!) I have personally never seen blanched almonds ground into a smooth butter, which is what I wanted for the recipe. Although I prefer the blanched almonds ground into butter, you can still use almond flour, the pancakes will just have a “grainy” texture opposed to a smoother, fluffier texture when using the “homemade” butter. I hope I cleared up any confusion! Do you have any recipes that have been successful with any other nut meal except macadamia? Thank you! I’m not sure I understand your question exactly… I have numerous recipes posted with nuts other than macadamia (smores, faux meal cookies and peanut butter cookies). If you are specifically asking about pancake recipes, You could use any other nut butter/meal in place of the almond butter. Pecan or hazel nut would be a good option, the ratio will change according to the nut used. I recommend using a butter over a meal for smoother, fluffier texture. Hola Mama; te escribo de Chile. mi hija Camila esta con dieta cetogenica hace casi 7 años, lamentablemente ella no mastica, asi que solo come leche y colados modificados a la proporción. Pero con la ayuda de tu pagina he realizado recetas nuevas a otra familia y Valentina las disfruta mucho. Muchas Gracias por lo que haces día día, bendicones a tu familia e hija especialmente. Estoy muy feliz de saber que has sido capaz de hacer las comidas que le gusta! Espero que tengan éxito continuo con la dieta cetogénica. Si mi español no es correcta, echarle la culpa a Google traductor!